A celebration of life for Lyle Livene McGuire, 92, of Coos Bay, will be held at 2 p.m., Saturday, Oct. 6, at the Coquille Valley Elks Lodge #1935, 54942 Maple Heights Road in Coquille. Private interment was held at Allegany Cemetery. Lyle "Papa" McGuire was born Dec. 7, 1925 in Yuma, Colo., to Finis and Genevieve McGuire. He passed away Sept. 2, 2018, in his Coos Bay home . Lyle moved with his family to Coos County when he was 8 years old. He later attended Coos River High. After graduation, Lyle joined the United States Army, training as a paratrooper and serving in Japan during World War II. After the war and a couple years of college, Lyle returned to the Coos Bay area and married the love of his life, Maxine Lundberg in 1949. He and Maxine raised their family in their beloved Allegany home. They loved camping, hunting and dancing to Dixieland jazz – Lyle’s love of the outdoors and dancing was both evident and contagious. Lyle worked as a logger in Coos and Curry Counties for 30 years, beginning his career with Bright Lumber Company and retiring as job foreman for Rock Point Logging. 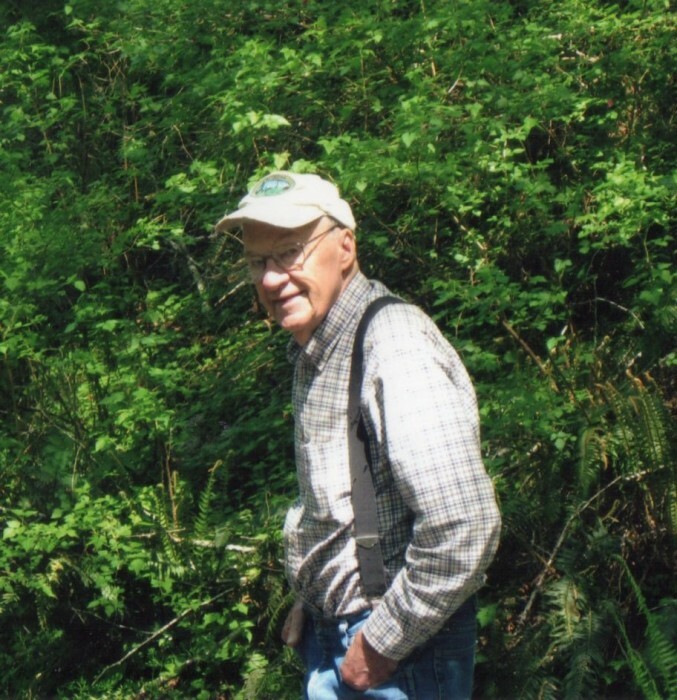 Upon retirement, he harvested his own timber, which he and Maxine replanted and managed for 40 years. Lyle was a proud and loving husband, father, brother and grandfather. His quick wit and impeccable story telling made visits with him both joyful and educational. He will be deeply missed by his family and friends, all of whom doubtless share many fond memories of their time with him. He is survived by his sister, Joyce Leuthold and her husband, Bill of Coos Bay; his daughters, Judy Knutson and her husband, John of Coos Bay and Cathy McDonald and her husband, Ross of Coquille; his daughter-in-law, Karen McGuire of Allegany; his six grandchildren and their spouses, Ty Koellmann, Bryan Knutson, Kelsey Pounds, Kara Davidson, Trisha McGuire, and Christine Mast; and 12 great-grandchildren. Lyle was preceded in death by his father, Finis; mother, Genevieve; brothers, Merle "Cork" and Dean; wife, Maxine; daughter, Linda Alderin; and son, Pat. Memorial contributions may be made to South Coast Hospice, 1620 Thompson Rd Coos Bay, or the Coos County Logging Museum, 705 Maple St., Myrtle Point.